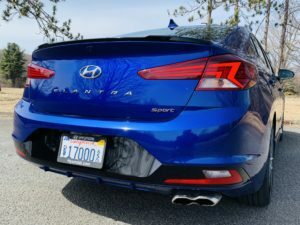 After a lull which began with the redesigned Sonata in 2014, Hyundai has recaptured their mojo. Along with their Korean counterpart Kia, the new cars and SUVs they’re currently bringing to market reflect the brand ethos that garnered so many accolades. And this refreshed Elantra Sport is the next in line. When it was redesigned for the 2017 model year the Elantra’s new look was met with a resounding thud. But with its thoroughly resculpted body including LED headlights and awesome wheel designs this Sport model now has the curb appeal to match its fun-to-drive nature. Affordable, efficient, fun and stylish, the Sport packs a lot of attractive attributes into what is technically a midsize package. It’s spacious all around yet feels agile like a sport compact should. I assume if you’re interested in this particular Elantra than you want something a little more than the 147 horsepower base engine offers. Mechanically speaking, the Sport is the only Elantra that runs with the 1.6-liter turbo-4 and a multi-link independent rear suspension. It’s also one of only 2 trims that can spec’d with a 6-speed manual, or as is the case here, a 7-speed dual-clutch automatic. Output is rated at 201 horsepower and 195 pound-feet of torque that’s available starting at only 1500 RPM. So there’s a pleasing sense of urgency when you get on it. There’s also a car-to-driver connectedness here that’s instantly palpable and hard to find in a sub $27,000 car. The steering is really quick to react and is perhaps the tastiest ingredient in the Elantra Sport recipe. Combined with a sport-tuned suspension, low center of gravity, thinner sidewalls and some respectably grippy 18” rubber, this is a car that’s fun to take through the corners, whether you’re paddle shifting or letting the DCT work its quick gear changes in Sport mode. It’s got a little gusto to its sound and keeps understeer to a minimum when you push it through the turns. It’s the kind of practical, everyday driver that’ll keep its owner amused without going broke…its 29mpg on regular unleaded speaks to that. And with Normal and Smart drive modes, the Sport can take on a variety of personalities to match your mood. This little turbo does a great job everywhere it’s utilized providing good low-end power and excellent fuel economy. I love the drive modes to accommodate different styles and Sport is definitely spunky enough to keep the enthusiast entertained by adjusting the steering effort, and the engine and transmission control logic for enhanced driving dynamics. And with Hyundai’s high performance N Line now available, this Sport trim finds an appropriate middle ground. Just be cognizant of the fact that with the Sport you’re going to feel and hear the road. And that’s the biggest knock against it; it’s relatively firm ride and some unwanted road noise. Otherwise, it’s manually-adjusted, huggier sport seats, real leather surfaces, flat-bottom-wheel and other Sport-specific touches make for a nice package but hard plastics and a cheap headliner are there to remind you that you’re still in a lower-end Hyundai. But no big deal; with the cool sport instrument cluster, heated seats, a great sounding Infinity premium audio system and one of the best infotainment systems on the market, the Elantra Sport treats its occupants quite well. And that includes the very accommodating rear seats and amply-sized trunk. SmartSense is the name Hyundai gives to its tech-driven safety features and for this year SEL trim levels and above add Forward Collision-Avoidance Assist, Lane Keep Assist and Driver Attention Alert to the existing group of blind spot warning, Rear Cross-Traffic Alert and Lane Change Assist. And I love the auto high beams. I’ve had way more fun here than I ever would’ve thought and the features per dollar ratio here belies this car’s $26,995 as-tested price. That includes the Premium Package with the updated 8” touchscreen with faster processor, navigation, Clari-Fi technology to clean up compressed audio and all of the Blue Link connectivity services free for 3 years. It’s simply a really solid, energetic, sporty sedan ready to please its owners.